On 1 October there was held a celebration in commemoration of the victims of the conflict of the years 1995 and 1996 in the northern zone of Chiapas. It was held in the community of Masojá Shucjá, municipality of Tila, where 8 were killed at the hands of the organization “Paz y Justicia” during those years. The event was attended not only by people of the community and neighboring ones but also by persons of other regions, including a delegation of the Las Abejas Civil Society (municipality of Chenalhó, in the highlands of Chiapas, which was another region that was particularly affected by violence at the end of the 1990s). 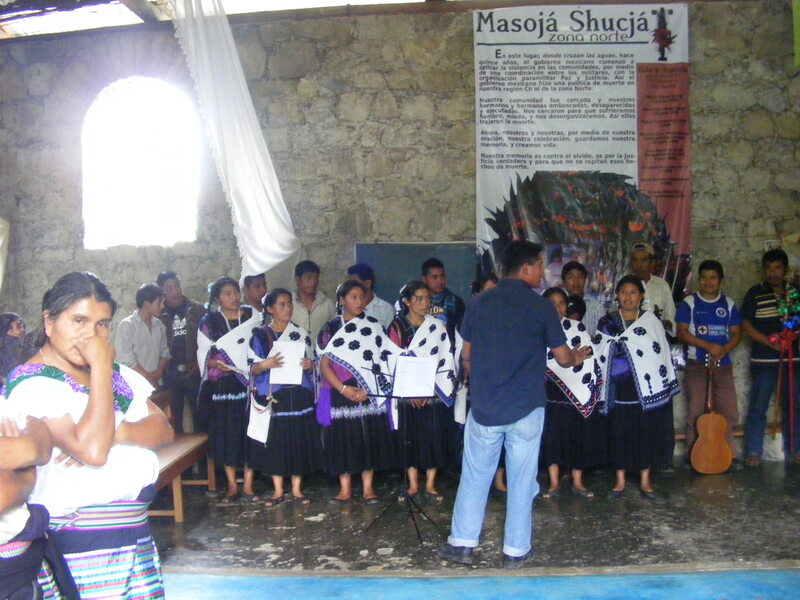 The choir of Las Abejas sang songs while a group of youth from this organization presented a theatrical work regarding the Acteal massacre of 1997. Following the religious celebration and the play, participants at the event walked to a small pantheon where some of the victims have been buried; there, relatives of the dead and disappeared prayed and presented their word, as did present and past victims in addition to others invited to the celebration. Four women from Jotalá spoke about how they experience violence today on the part of the government. A resident of the Nuevo Retorno community gave his word by narrating how it was that those displaced from Miguel Alemán, a bastion of Paz y Justicia at the time, relocated themselves in 2002 to Nuevo Retorno after having lived for years in Masojá Shucjá. The entire commemoration was a call to maintain alive memory and to continue demanding justice for the victims: Romeo Pérez Pérez, Minerva Guadalupe Pérez Torres, Mateo Hernández López, Juan Ramirez Torres, Hector Pérez Torres, Encarnación Pérez Pérez, Maria Rebeca Pérez Pérez, Sebastián Pérez López, among those who fell in Masojá. In this place, where the waters cross, 15 years ago the Mexican government began to apply violence against the communities by means of a coordination among the military and the paramilitary organization Paz y Justicia. In this way the Mexican government engaged in a politics of death in our Ch’ol region of the northern zone. Our community was besieged and our brothers and sisters ambushed, disappeared, and executed. They besieged us so that we would suffer hunger, fear, and disorganization. In this way they brought us death. Now we through prayer and celebration save our memory and create life. Our memory is against forgetting; it is for true justice, so that these acts of death do not repeat themselves. The armed conflict in Chiapas is part of a strategy of counter-insurgency; the Mexican government incentivized the creation of paramilitary groups in different regions of the conflict zone. Among these paramilitary groups was distinguished for its cruelty and operative capacity the organization Paz y Justicia, which operated in the Ch’ol territory of the northern zone of Chiapas in the municipalities of Salto de Agua, Sabanilla, Tila, Tumbalá, Yajalón, and Sabanilla. 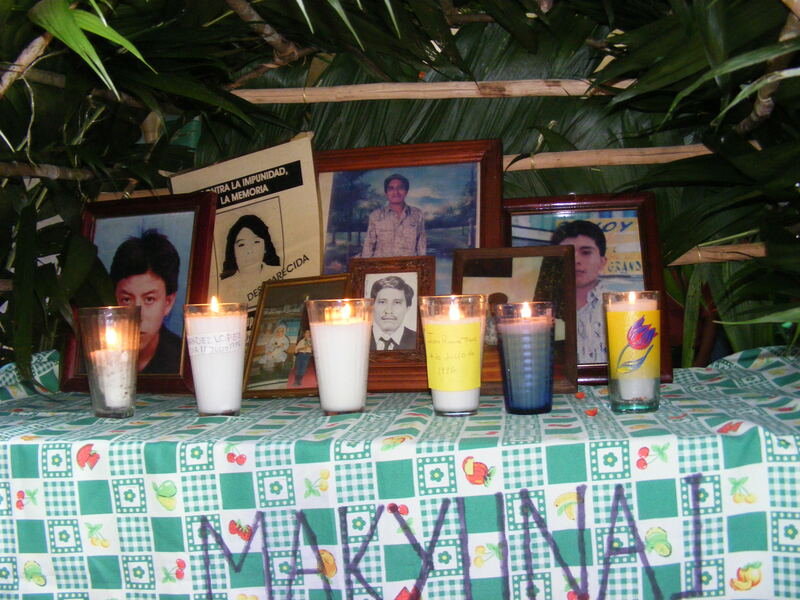 This documented counter-insurgency strategy left 122 cases of disappearances and executions in the period from 1995 to 2001, of which 37 were forced disappearances (32 men and 5 women) and 86 executions (74 men and 7 women). This entry was posted on Friday, October 7th, 2011 at 1:50 pm and is filed under Chiapas, Disappeared, EZLN, Human Rights, Human Rights Defenders, Indigenous people, Justice system, Mexico, Militarization, Paramilitary, religion, torture, Women. You can follow any responses to this entry through the RSS 2.0 feed. You can leave a response, or trackback from your own site.